Paul Crampton Contractors, Inc. has designed and built homes in Washington County for over 40 years and has earned a reputation for quality construction, value, and excellence in customer service. 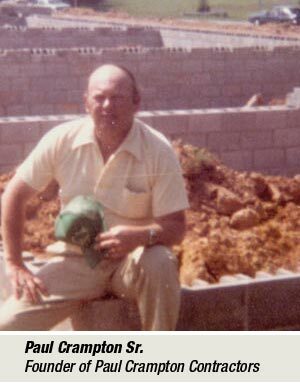 What began as a small home improvement company in 1967 by Paul Crampton, Sr., with a vision to build a company devoted to customer satisfaction with every job no matter the size, grew into a company that employs over 50 people involved in every phase of construction, from site work to complete finished product. His goal was always customer satisfaction. In 1978 Paul Crampton, Jr., joined his father on a full time basis. Together they developed Towne Oak Village, their first townehome development. This included two story townehomes with attached garage, and several years later, due to customer demand, designed a one story townehome with attached garage. This would become the first townehome of its kind in Washington County, laying the groundwork for an active adult lifestyle community. This type of living was carried on to their next development, South Pointe. In 2007 a third generatoin has joined the company for the beginning of their newest development, Emerald Pointe. Paul Crampton, 3rd has come on board full time, and will be at Emerald Pointe to assist the company in the construction and sales of our newest home designs, and continuing to maintain our desire for complete customer service and satisfaction.